The concept of ’sovereignty’ is typically taken to mean the ability of states to make their own laws and determine their own policies. But the role of the EU in questions of sovereignty is complex. On the one hand, EU membership requires transferring powers to the European level, but EU membership can also provide an avenue for states to mitigate the impact of globalisation on their decision-making. Drawing on new survey evidence, Catharina Sørensen illustrates how these issues play out in shaping the attitudes of citizens toward European integration. Sovereignty concerns have been the decisive factor in Denmark’s eight EU-referendums: At the latest referendum, in 2015 on transforming the country’s opt-out on justice and home affairs (JHA) into a British-style opt-in, 68 per cent of no-voters were motivated by sovereignty concerns. In practice, it is debatable if the opt-in would have strengthened Denmark’s sovereignty by empowering the Danish parliament to make decisions on a case-by-case basis, instead of being automatically excluded. But Eurosceptics successfully transformed the referendum campaign into a debate about preserving national control, as if the very act of ’touching’ the opt-out automatically entailed a loss of sovereignty. The sovereignty question has significant implications for Denmark’s position in ongoing debates about the future of Europe. If Denmark preserves its EU opt-outs on JHA, defence, and the euro – areas of cooperation where there is significant movement towards enhanced cooperation – and if Denmark were ever to edge closer to a “Danexit” (this is not on the table, but the second biggest party in Parliament, the Danish People’s Party, has spoken in favour of an in-out referendum), it would exclusively be because of sovereignty-based Euroscepticism. The sovereignty debate has been around for decades, but while there is substantive literature on the concept of sovereignty, and its role in a globalising world, public perceptions of what sovereignty actually means are surprisingly poorly documented. Key questions still remain unanswered. What does the public believe happens when sovereignty is ’handed over’ to the EU? Is sovereignty perceived to be a zero-sum game? And what are the most important elements for being sovereign? To answer these questions, we conducted a survey of 2,056 people and held focus groups on the EU and perceptions of sovereignty. Our survey paints a picture of a comprehensive sovereignty-based Euroscepticism in Denmark. Figure 1 below shows how our respondents position themselves on the question of handing over sovereignty to the EU, on a scale from 0-10. Around 47 per cent were reluctant to do so, and only a minority were comfortable with it. Most Danes view it as a problem that EU-cooperation involves handing over sovereignty; a concern that unites Danes across the political spectrum. Note: There were 2,056 respondents included in the survey. 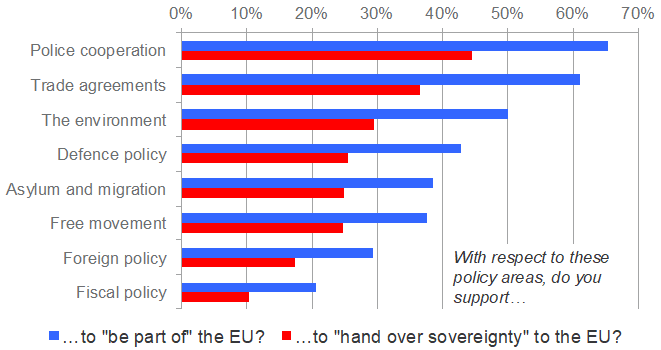 Respondents were asked the extent to which they supported handing over sovereignty to the EU on a 0-10 scale (0 incicating full support, 10 indicating no support). Compiled by the author. However, the survey also simultaneously confirms that Danes are highly supportive of EU-membership. Around 65 per cent of respondents wished to stay in the EU, and an absolute majority believed that the EU is good for the country’s economy and approved of the EU’s democratic standing. Despite Denmark’s reputation as a Eurosceptic country, this support is by no means a one-off occurrence and has been found in other surveys going back decades. Indeed, previous data indicates that Danish citizens hold some of the highest levels of EU-support among all member states. Danes might not want to hand over sovereignty to the EU, but they also do not want to leave the EU and are highly supportive of the EU’s economic role and level of democracy. We explored how much ’sovereignty’ mattered for Danish EU-attitudes by splitting our sample into two groups and asking each group to indicate support for EU-cooperation across a number of policy areas. For one group, we added that cooperation entailed a hand over of sovereignty; for the other group there was no such statement. As Figure 2 shows, throwing ’sovereignty’ into the debate has the potential to move opinion towards cooperation by up to 24 percentage points. For all policy areas surveyed there was a significant decrease in support. Strikingly, when the JHA-referendum was called in spring 2015, the yes-side was leading in the polls by some 20 percentage points. During the campaign, where sovereignty became a major theme, support vanished. Note: There were 2,056 respondents included in the survey, split randomly into two groups. Compiled by the author. It is clear from our study that there is no disagreement as to whether it is a good thing that Denmark is sovereign or has the power to decide for itself. Other studies have shown that close to 100 per cent of Danes feel attached to their country, and Danes have typically been the EU-population the most satisfied with their quality of life and the least inclined to think that their country is in need of reform. Disagreement arises as to how Denmark best goes about preserving its sovereignty. Does closer EU cooperation weaken, or strengthen, Denmark? Perhaps spurred on by the exclusive focus of Danish EU-debates on sovereignty being ’handed over’, Danes to a great extent believe that only the former happens and react with incredulity towards the latter possibility. 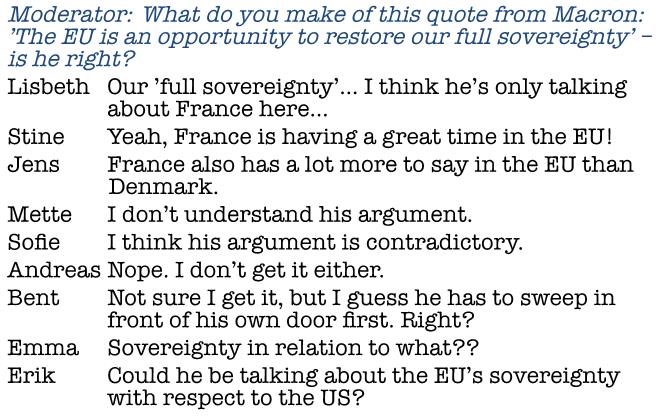 The below transcript from our focus groups show how participants reacted when presented with a quote by French president Emmanuel Macron, who has stated that Europe today can help member states protect their sovereignty. Note: This transcript has been translated into English by the author. 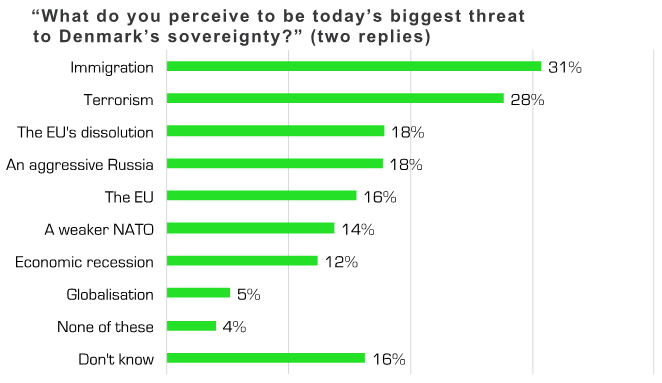 When we asked respondents about what actual developments challenge Denmark’s sovereignty today, the EU, however, featured far down the list (and interestingly slightly below the EU breaking down). Immigration and islamist terror were far bigger concerns, as shown in Figure 4 below. Note: There were 2,056 respondents. Compiled by the author. Moreover, as Figure 5 indicates, our survey showed that a majority of Danes support a greater role for the EU in the face of some of the concrete concerns they worry about today, which include an ‘aggressive Russia’, a ‘weaker NATO’, and ‘Donald Trump’. This highlights a significant opportunity for the EU as a provider of security and community: at a time of high uncertainty, few desire isolation. Our study therefore suggests that the EU provokes an instinctive reaction among Danes. When taken in isolation, sovereignty has been reduced to an either/or issue, but when broader globalisation dynamics are brought in, these attitudes become more nuanced. Possibly this reaction dates from a time when globalisation was felt to be less acute. The EU exerts a very large, and very visible, impact on member states’ sovereignty, understood as their independent ability to determine their own laws. Other global forces, such as migration, the interdependence of markets, and digitisation, are also undermining traditional understandings of national sovereignty, but they do not come with the formal transfers of power that the EU does. As a consequence, the term ’handing over sovereignty’ has become reserved for what happens in the EU and our survey confirms that this is perceived to lead to a less independent Denmark. The question is whether this is really what is at stake. At least, empirical data and the literature on sovereignty and globalisation suggest that a more nuanced understanding is required of the forces at play in the battle of nation states ​​in a globalising world. The Brexit negotiations show that even for one of Europe’s largest countries, it is incredibly difficult to take back real sovereignty by withdrawing from the EU. While a growing body of research focuses on understanding the changing conditions for national sovereignty, or on empirically accounting for the power of states vis-a-vis the EU, relatively little attention has been paid to public perceptions about sovereignty and how these may be changing. However, our study is important in a global context where many observers point to a general crisis of political trust and in the legitimacy of transnational cooperation, alongside sentiments of growing neo-nationalism and increasing support for populist parties who demand in/out referendums on EU-membership. Catharina Sørensen is Head of research at Think Tank EUROPA. Good job, Catharina, we need more and larger (more accurate?) surveys like this. It would be very interesting to do similar surveys in similar nations (Norway, non-EU member, and Finland, non-NATO member). I expect Finland would see immigration, terrorism and Russian aggression as less of a threat than Danes do..